Thanks for stopping by! 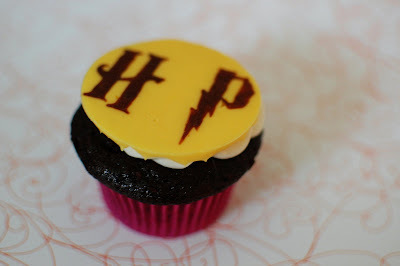 Be sure to check out my other Harry Potter treats: More Harry Potter Cupcakes, Butterbeer, and Golden Snitch Cake Pops. A big group of friends decided to go see Harry Potter and the Half Blood Prince in IMAX. Hubby and I are both big HP fans (ok, maybe it’s really just me and I drag him along to this stuff… He’s not the one with the HP theme ringtone… although he did read all 7 books too… In fact we had to buy two #7s because neither of us wanted to wait for the book…) and we already saw the movie when it first came out. But it wasn’t released in IMAX until the end of July. I don’t know if it’s marketing genius or what, but I guess their ploy worked on us because if it had come out in IMAX at the beginning, we probably would have only gone to see it once… But I digress… Since we had such a large group, we decided to get there early to get seats together. 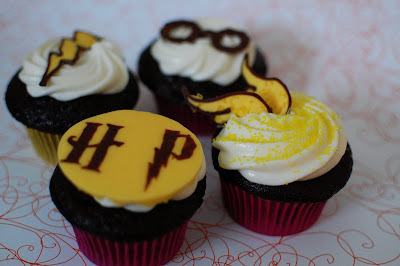 And since we’d be standing/sitting around for a while, I thought I’d bring some cupcakes. 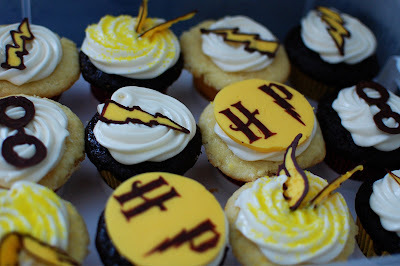 I wanted to decorate them with Harry Potter objects and decided to make some chocolates to put on top of the cupcakes. The process itself is quite simple. First, I made a stencil on my computer and printed it out. I taped some wax paper over the printout so the paper wouldn’t move. Then I melted some chocolate and yellow Wilton candy melts in a disposable piping bag. I snipped off the end and began piping. As you can see I don’t have a perfectly steady hand, but I think they look good. 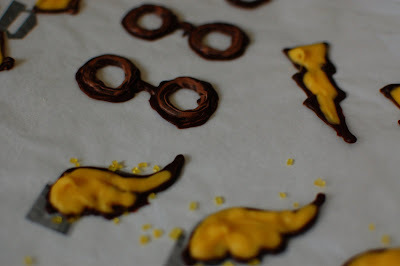 For the snitch wings, I piped the chocolate, then put some sprinkles on the waxed paper, then piped the yellow. 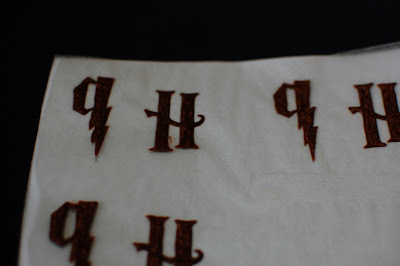 For the H and P, first I downloaded the Harry Potter font from DaFont.com. The first time I printed my stencil I forgot to make a mirror image of the letters. Since I wanted the smooth side to be showing on top of the cupcakes, I needed to have that mirror image. Once I got that all straightened out, I would pipe a small amount of chocolate onto the thicker parts of the letter. I then used a toothpick to do the detail work. It was a bit time consuming to say the least! When I went to take the H & P letters off the waxed paper, they were too fragile to stay together. So in a last second decision, I used the yellow candy melts to make a big ole circle around the HP. I think they looked great, but wished I would have thought of that first because I would have made my H a little closer to the P. I used my round cookie cutters (see Dad, they’re really useful!) to make the circle of yellow chocolate over the HP. I decided to just make chocolate and white cupcakes with cream cheese frosting. I love filling cupcakes, so I filled them with some homemade strawberry jam that Hubby’s mom’s boyfriend gave us recently (it’s AMAZING!). Since I hate making recipes more than once, I decided to try a new chocolate and a new white cupcake recipe. I decided to go with Martha’s one bowl chocolate cupcake recipe and the Billy’s vanilla cupcake recipe from my Top 10 list. The chocolate cupcakes were great and I love the idea of only dirtying one bowl! I found the vanilla cupcakes to be a bit fussy. The batter tastes amazing, but I used my ice cream scoop as usual, and they were too full and spilled over and made the weird flat cookie look on top of the cupcakes. I think I’m still on the hunt for a great fool-proof vanilla cupcake recipe. I’m not going to copy the recipes here, they’re out on the Internet hundreds of times. Here are links to Martha Stewart’s One Bowl Chocolate Cupcakes and Billy’s Vanilla cupcakes (another Martha Stewart recipe). I frosted the cupcakes with Cream Cheese Frosting. Don’t forget to enter in my 2nd blogiversary giveaway by midnight on August 13th! I’ve had fruit hand pies on my to-bake list as well. I haven’t spotted a strawberry version until now, and these look very tasty! 9 1/2 cups of flour for the dough? Wow! Sherry – Alton Brown gives all his recipes in ounces. So as the recipe states, it’s 9 1/2 ounces of flour, which is about 2 cups. These look fantastic!! I love your theme weeks! I must make this! perfect breakfast treat. Lovely hand pies. YUM! These look great! I am making them this weekend, I cannot wait!! 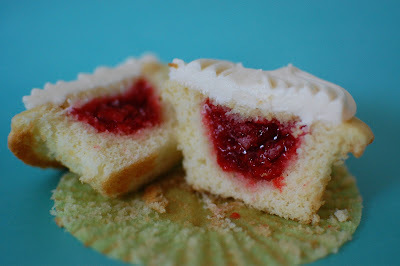 Whenever I am looking to bake something new, I ALWAYS check your blog and I ALWAYS find something spectacular to make!! Thank you for having such a wonderful blog, and thanks for sharing them!! these look so delicious! I love how easy (and delicious) they are to eat! what kind of blueberries did you use wild or regular?